Download this report in Sinhala and Tamil. 27 December, Colombo, Sri Lanka: Social Indicator, the survey research unit of the Centre for Policy Alternatives conducted an island wide pre election opinion poll with the objective of identifying Sri Lankan voter perceptions and attitudes on key topics being discussed in the lead up to the election and thereby contribute to the current political discourse. Sri Lankans remain hopeful that the 2015 Presidential election will be free and fair with 40.3% saying that it will be free and fair and 21.5% saying it may be free and fair. 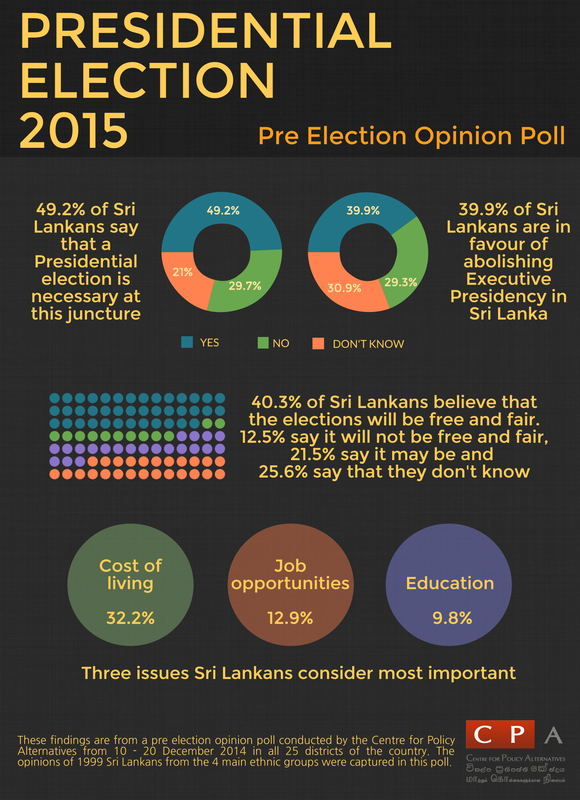 Only 12.7% of Sri Lankans don’t think it will be free and fair while 25.6% said that they don’t know. Almost 50% of Sri Lankans believe that a Presidential election is necessary at this juncture while 29.7% don’t think it is necessary. From the four main ethnic communities, 67.5% from the Up Country Tamil community, 62.5% from the Muslim community, 47.1% from the Sinhalese community and 46% from the Tamil community think that a Presidential election is necessary. When asked if the Constitution should limit a President to serving a maximum of two terms in office irrespective of their popularity, 48.4% of Sri Lankans agreed that it should be limited to two terms, with 24.8% saying that they strongly agree. 39.9% of Sri Lankans are in favour of abolishing Executive Presidency in Sri Lanka while 30.9% said that they don’t know and 29.3% said that they are not in favour. The three issues that Sri Lankans consider most important are cost of living (32.2%), job opportunities (12.9%) and education (9.8%). For the Sinhalese community the three most important issues are cost of living (34%), job opportunities (12.4%) and security (10.9%). For the Tamil, Up Country Tamil and Muslim communities the important issues in order are cost of living, education and job opportunities. Conducted in the 25 districts of the country, this opinion poll captured the opinion of 1999 Sri Lankans from the four main ethnic groups. Fieldwork was conducted from the 10 – 20 December 2014. Please click here to read the full report online, or here to download it as a PDF. Download the infographic in high resolution here.